Nvidia cleaned house late last year with the introduction of their two Maxwell cards, the GTX 970 and GTX 980. Since then the Green team has pushed out another 900 series card, as well as a brand new flagship in the form of the recently launched Titan X. The GTX 980 has been knocked from its perch, but it doesn’t mean it’s out for the count just yet. The GTX 980 is still there to deliver lighting fast performance at a third of the Titan X’s cost – but is it enough to beat its real market competitor? The ASUS Matrix GTX 980 is, as you’d expect, not the best place to go looking for price/performance answers. The Republic of Gamers-branded card is the second ASUS has pushed out, not counting the reference card that everyone had at launch. It comes with all the bells and whistles you’ve come to expect from the enthusiast brand – ranging from factory overlocks to massive financial losses in your pocket. Straight out of the gates, the GTX 980 Matrix features a noticeable overclock to its core clock, reaching a nice 1241 MHz over the standard 1126 MHz clock speed. The memory clock has curiously remained untouched though, ringing in at the normal 1750 MHz. That’s definitely modest when it comes to the Maxwell architecture, which has proven that it can take an overclocking beating and then some. 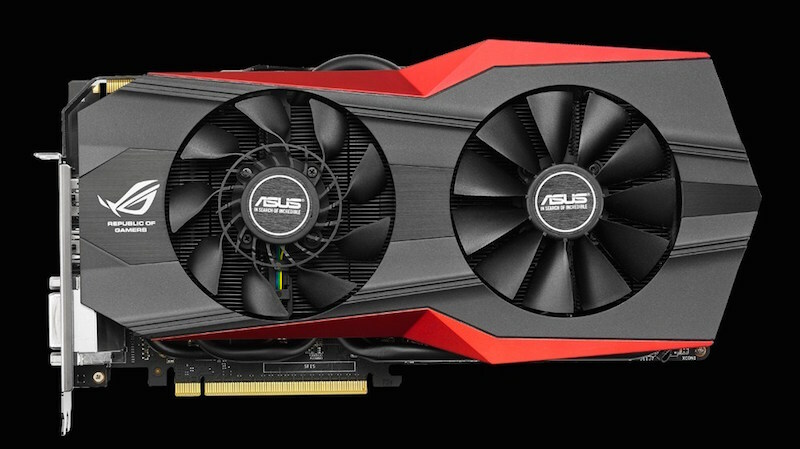 For the extra money ASUS expects you to throw down on this card, it would’ve been nice to see more work done on actually making it faster. There’s also the stock 4GB of GDDR5 memory (the full 4GB) across a 256-bit wide memory bus, 2048 shader units and 64 ROPs. 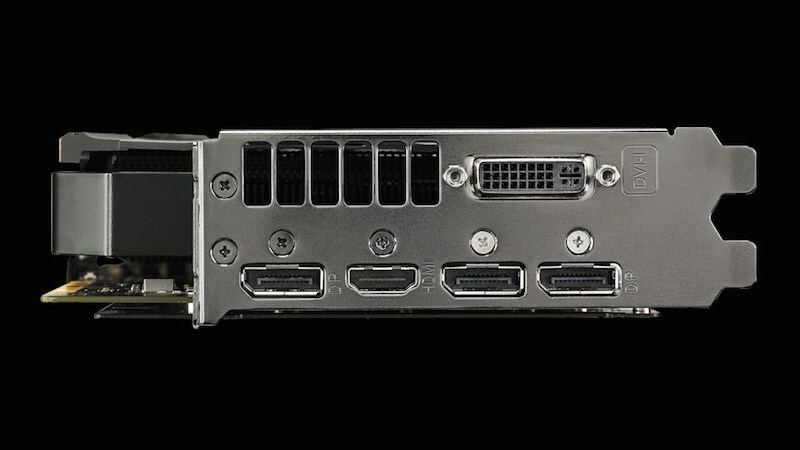 You also get a single HDMI and DVI ports, as well as three DisplayPorts for triple monitor setups. 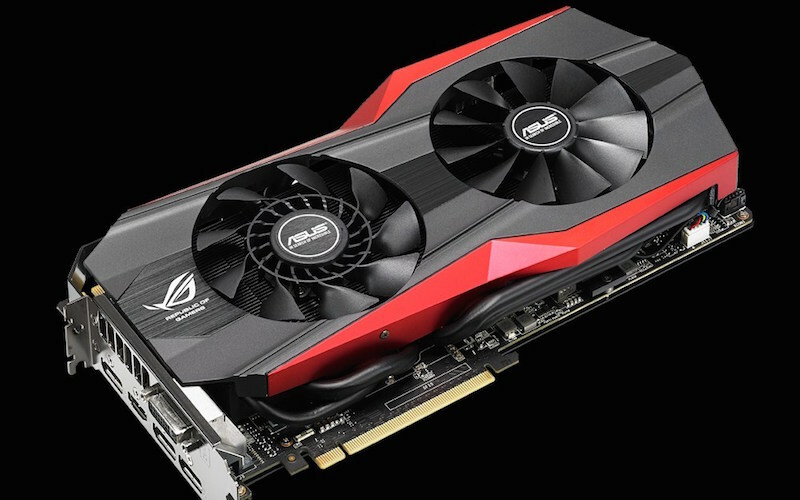 The Maxwell chip comes wrapped in a premium casing though, with the striking red and black ROG color scheme distinguishing the Matrix card apart from the rest of the ASUS line. The DirectCU II cooler has, however, picked up a few tricks from its aviarian sibling, ripping the Strix cooling scheme that has made it so popular. The card still features the LED indicator that shows off the card’s current heat, but the dual fans now only start spinning when they’re really required. During testing, this only happened at around the 55 degrees celsius mark, with the card never tipping over 70 or so degrees. Maxwell runs cool, and the DirectCU II solution works brilliantly with it. The extra cooling horsepower comes with a small drawback, raising the card’s TDP from 185W to 195W. It’s still incredibly low for a leap forward in processing power, and shows where Nvidia was really focusing their efforts with the Maxwell range. The card is powered by two 6-pin connections, so there’s nothing fancy to it there either. The 980 Matrix is, however, a bit chunkier than the Strix models, and I found myself having to get creative with how I got it into our test rig – which is something I haven’t yet experienced. It’s just a little lengthier than most cards, so be aware of that of space is an issue with your chassis. But if you’re dropping this much dollar (or Randella, in our case) on a card like this, you want to see some impressive numbers though, right? That’s a department where the GTX 980 Matrix doesn’t put one wrong foot, becoming the most powerful card we’ve tested yet in the Lagzatron. Unsurprising, yes, but it still made me all sorts of warm and happy inside. 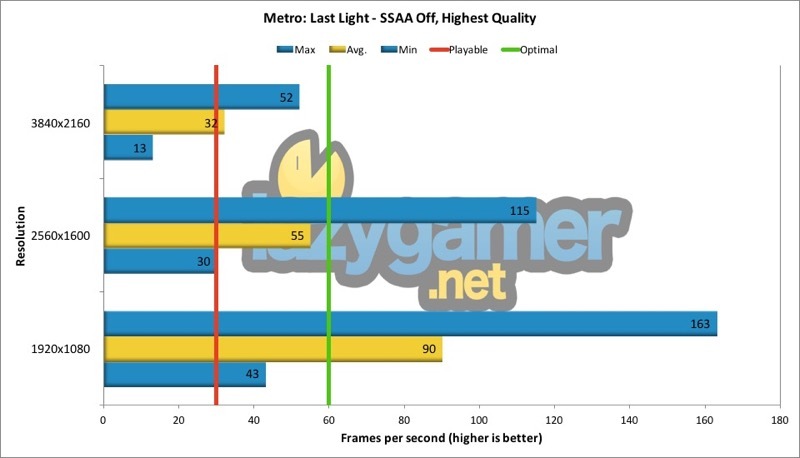 Metro: Last Light might be old, but it’s included benchmarking software still acts as one of the most reliable tools when testing real-world performance of modern cards. The game also manages to be quite grueling at higher resolutions, but the GTX 980 Matrix managed to hold its own even under 4K. It’s not the most ideal playing conditions, but it’s bloody impressive for a single, 4GB card. 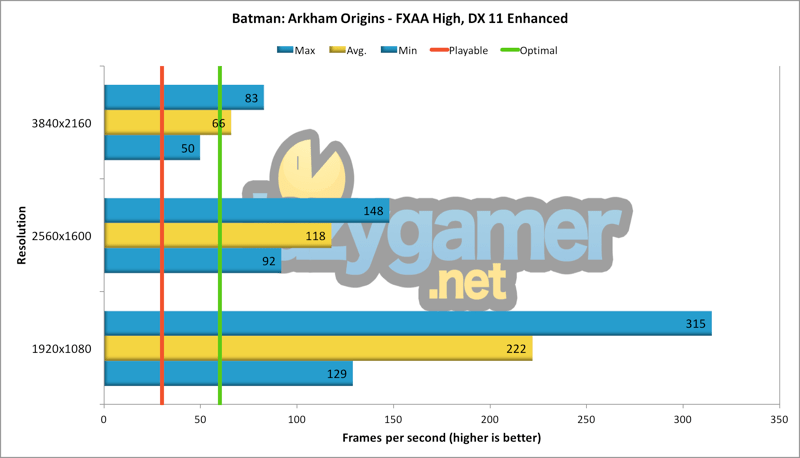 Arkham Origins is easily the least taxing of the four game tests we conduct, but it is useful in seeing performance in the widely used Unreal Engine. As expected, the game really didn’t pose a threat to the GTX 980, with even 4K rendering on the benchmarks not bringing the frame rate below the smooth 60FPS mark on average. Arkham Knight will certainly replace Origins in June, but for now rest assured that anything running on the Unreal Engine should do just fine with the GTX 980. More than fine, in fact. 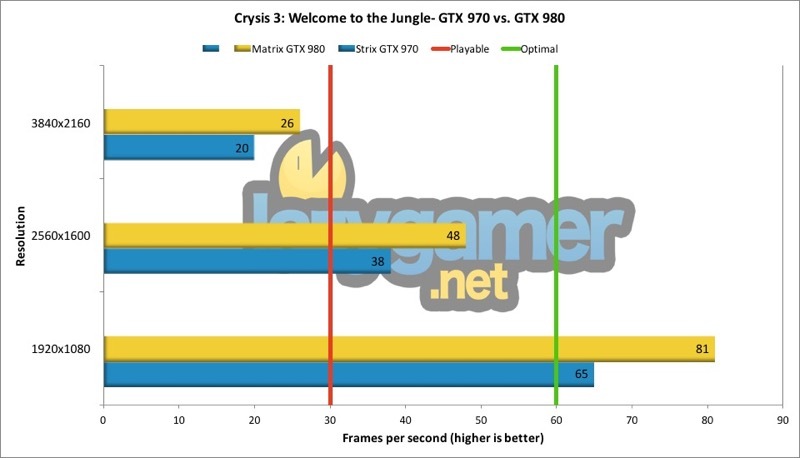 Oh Crysis, will there ever be a day when benchmarks don’t need you? The games may have become worse as they went, but the Crysis franchise still manages to serve one good purpose to this day. Crysis 3 isn’t too terrible at 1080p, but crank it up to 4K and things start becoming a slideshow on most cards. The GTX 980, however, keeps things manageable, and while it’s certainly not perfect at the UHD resolution it’s impressive again for a single card configuration. 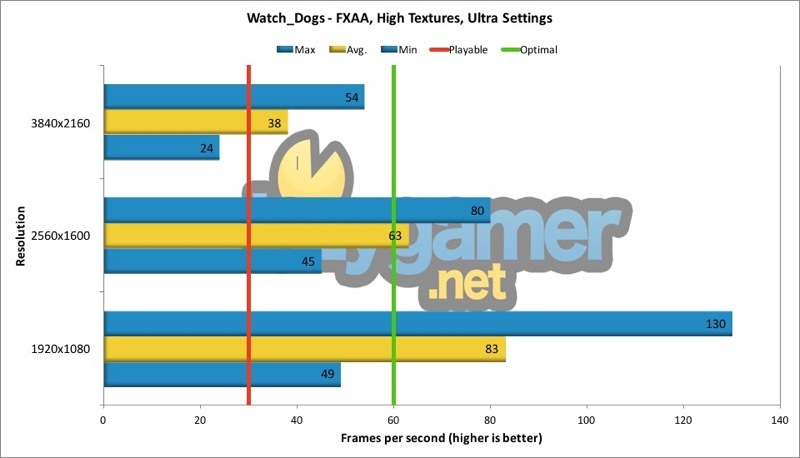 Watch_Dogs still looks the part when you start raising the resolution roof, and it still manages to make a surprisingly large dent on processing power when you do. The game at 1080p is easy pickings for the GTX 980, and even at 2K it seemed like smooth sailing. At 4K though, it chugs along, and even though the numbers look a touch below decent, you don’t want to play a game at this frame rate. Still, impressive for what it does achieve though. On the Futuremark side of life, the GTX 980 managed to bring homes scores of 11984 on the Fire Strike test, and an even more impressive 6251 on the more taxing Fire Strike Extreme test. That’s above and beyond what the GTX 970 Strix managed to score, and makes a compelling argument for the beefier card over its smaller sibling. The real-world results of the cards going head-to-head though make it a far more interesting debate. The GTX 980 is the winner throughout all the tests (and there was no doubt about that from the start), but the interesting part of it all is by how much. 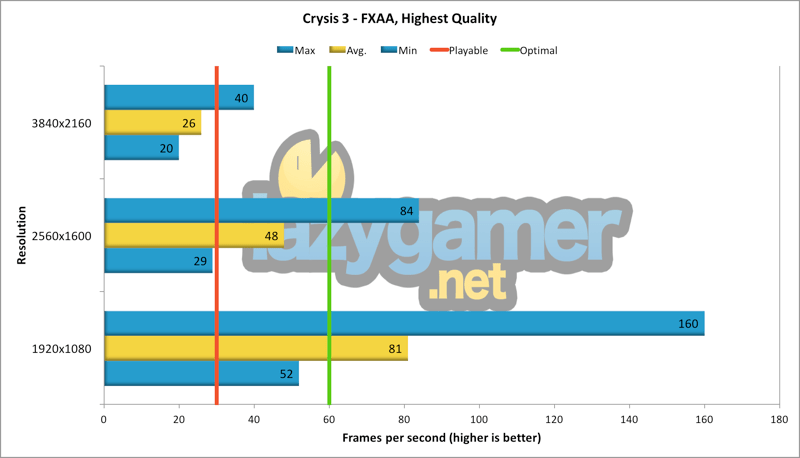 At 1080p, the difference is rather big on both Metro and Crysis, with as much as 16 FPS between the two. The gap actually shrinks as the resolution increases though, as the clock difference between the two cards makes way for better memory speed and efficiency. Both cards are near identical in this regard, with the recently uncovered memory bottleneck on the GTX 970 not really showing an immediate effect against 4K resolutions. It’s there, definitely, but the actual impact of it is very difficult to replicate. And it’s part of the reason why the GTX 980 still makes very little market sense. You can pick up one around the R10 000 region, but this ROG Matrix variant will set you back a hefty R13 000 on average. For a little perspective, that’s more than R6000 more for a card that only manages around 15FPS more than the GTX 970, with the Strix version retailing at around R6000. It makes very little sense, 1080p or 4K, to double down on the GTX 980 for the ludicrous price it’s asking – and it’s why Nvidia isn’t really worried about the memory debacle surround their market superior Maxwell card. The GTX 980 exists to satisfy the “I have the best card possible” crowd, but makes little sense in a price/performance comparison. Yes, the GTX 980 Matrix is the most powerful card I’ve tested yet. Yes, I’d absolutely die at the chance to have one in my personal gaming rig. Yes, I love the ROG design. But I simply can’t look someone straight in the eye and say it’s the best card they could pick up on the market right now. The GTX 980 Matrix is reserved for the upper-end of you PC enthusiast out there – with more money than you have sense to spend it with. 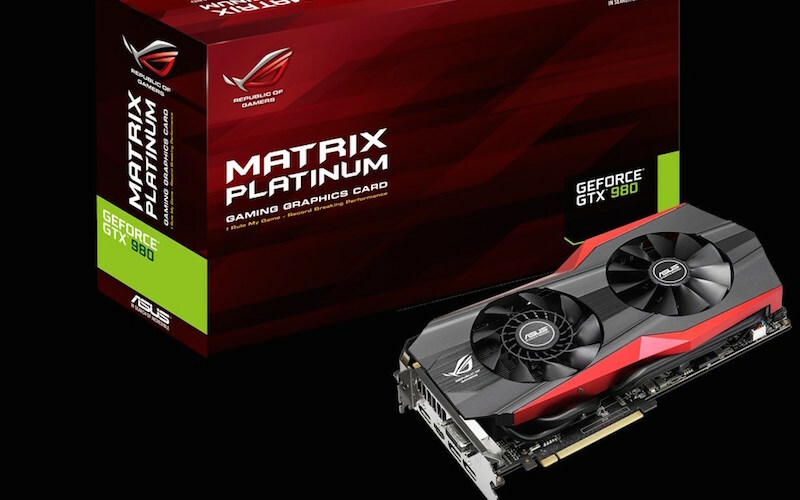 The GTX 980 Matrix is one of the most powerful versions of one of the most powerful cards on the market at the moment, but you'd easily find better performance for the price looking at other Maxwell offerings.